Ms. Moore has been teaching English Literature at the high school level since 1999; she has been at Mission San Jose High School since 2001. Currently teaching English 10A and AVID 9/10, Ms. Moore is committed to helping students become better writers and learners. She has been the English department chair for Mission San Jose High since 2004. Most recently, she has been the Common Core Liaison since 2012 where she helps to support teachers and students through implementing the new Common Core standards. 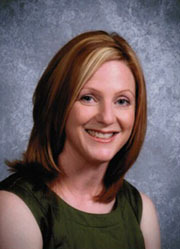 Ms. Moore attended San Francisco State University where she graduated with her Bachelors of Arts in English Literature. Soon after, she continued her education and attended Chapman University where she received her teaching credential. Recently, she earned her administrative credential and a Masters in Educational Leadership through California State East Bay. Working closely with Facing History and Ourselves, a worldwide organization that strives to foster empathy through curriculum and teaching, Ms. Moore is dedicated to implementing those techniques into her curriculum so that her students are realizing that their education is not something to take for granted. As a recipient of the Rene Molho Holocaust Education Teacher of the Year award for “Yom Hashoah V’Hagevurah” (Holocaust Remembrance), Ms. Moore is proud to see how her passion for teaching continues to ignite the students she works with on a daily basis. When she is not teaching, Ms. Moore enjoys spending time with her family. She has two elementary aged boys in the Fremont Unified School District. Ms. Moore also enjoys reading, traveling, watching movies, cross-stitching, and most importantly, Disneyland! She looks forward to working with the talented students at Mill Creek Academy.